I’m an Otaku that has recently taken up the interest of writing my own blog site after interacting with the community at Dannychoo.com. I was born in Hong Kong (Yes, I can read and write Chinese) but my family immigrate to the U.S. during the early 90s. I grew up watching Kaman Rider V3, Daitetsujin 17 and Spaceship Yamato. My main interest is to collect figures, gunpla, search for and collect anime and superheros back in the 80s (super classic fan), but I do try to keep in touch with current trend. I go to work as a Mechanical Engineer in the electronic/telecommunication industry during the day and I moonlight as an Anime/Eroge Game/Figure collecting Otaku during the night Why yes, being Otaku for me is like having a second life different from my day time experience. I also participate in MMORPG like Final Fantasy XI. Having almost been implementing my Otaku life style exclusively on my own, I was taken by surprise by the friendliness in Dannychoo.com. After careful consideration, I decided to take up blogging to better represent myself in DC community. My main goal for this blog represent my first attempt to blend my engineering experience with my otaku life style. Within the process, I hope, would be useful not just to me, but to a larger community. I not a big figure blog follower but have come across yours a few times mainly on the topic of dust! 1) Like you I am not a big fan of detolfs since the space below the knees is wasted for displaying figures as you can’t really see them. The leads me to believe that your dust sheild method is better since you can place figures on the top half of an Ikea Billy bookcase and use the bottom half for books etc. However there is one problem – judging by some of your photos the plastic seems to sometimes have a bit too much glare and also can look a bit ‘tacky’. Please don’t be offended by what I am saying; although a good temporary solution I do not believe it is a long term one – afterall we are buying expensive figures to why not display them the best way right? My solution is to modify your method: recently ikea have produced a glass door half the height of a billy unit. These doors are just a plane of glass without the border so it is like the front of a detolf in that respect. What I suggest is using this instead of the dust sheild sheet. It would look more asthetically pleasing and professional. But there will be gaps right? Well this is the time to use the plastic sheet – simply use it on the small areas to seal the gaps. This way your display is ‘air-tight’ and also the majority of the ‘barrier’ will be glass so it would look nicer. 2) This brings us another problem though. The advantage of a detolf is that light can get in 360 degrees while with the dust shield method it can only get in the front. This means our figures are not adequently lighted. Again Ikea can offer us a bit of a solution: replace the top half of the billy wooden shelves with glass shelves. This would at least allow light to go to the shelves below the top one. What I intend to do though is go one step further and add led lighting as well to the sides and back edges of each shelf. This way we get natural lighting form the front and downward and leds to light the sides and back of the figure. I intend to use leds recommened by a blog called Tenticle Armada – I believe you know this as I have read your comments there. With the modified dust shield with glass front and sheet covering the gaps, glass shelves and led lighting I believe this is the best solution for the top half of a billy bookcase and is the best way to display figures. Please let me know what you think. 3) But this is one last problem and I need your help answering. This method does not allow natural light from the side so intead I have to use leds. What I want to ask is: are your figures on your bookcase near the sides of the case as well lit as the ones in the middle? If so that is good. If not I will have to think about it more. First of all, thank you for your comment! I started this blog in hope of someday to find someone who shares the similar line of thinking as I do, I am grateful to see you taking the time to comment, and a technical comment to boot! This is like from the wildest of my dream! Let’s get to the meat of the discussion. I am glad to see you share the same feeling with me on the topic of the Detolf, it’s has the weaknesses that we both agreed on, and it’s structurally weak (I guess you can speak to that more than I do!). I don’t feel comfortable to put some of my heavy painted resin on the glass levels. But straightly from a dust standpoint, I have came across someone who uses foam weather stripping to seal off the door of the Detolf, and it seems to work for him; but it doesn’t solve the problem with the lower half of the shelves being less useful than the top half. Ah yes, my dust shield is not perfect, I am well aware of it. Originally, I only meant to take whatever material I have available on hands and make the best use out of it. It’s original purpose is to seal windows, and it’s meant to be stretched with a hairdryer so it’s somewhat sensitive to heat, but I don’t stretch them because I want to be able to pill it off and organize my figurines so I replace the the bottom double sided tape with a double side velco straps to facilitate easy removal. You could however, use a different thickness plastic sheet to achieve the same result without the winkle. I believe I know which glass door you are talking about, it’s the ones with a thin metal frame around it? I should consider looking into it. We need something to take up the gap and tolerances of the glass door, but I am not sure if I follow your thought on this part. Yes, the Detolf does have the all glass appearance and 360 deg ambient light advantage, you can’t take that away from the Detolf, it’s definitely nice. The all glass appearance was actually a problem for me to add LED strips to it, but I have managed to come up with a decent solution to circumvent it, not sure if you had looked at that topic? I am not aware of Ikea having glass replacement for the wooden shelves, this is a new discovery for me! I will have to look into it. The way I arranged my LED strips right now is catered to the center, the sides are not as well lid as the center ones. I could use some of those provided male female adapters to spread out the 2 LED strips more evenly though, that should make a difference. Yes, I frequently visit Tenticle Armada. Depending on the figure density you are aiming for, it may or may not be a problem. I am afraid if you are to add LED on the sides it would be too close to the figures and may be too bright, unless you can dial down the power to them. I would suggest looking into some form of reflector if you are concerned about having adequate lighting to the sides. I was wondering if you could tell me where you got your lighting for your detolf and bookshelves. I think the way it illuminates your figures is perfect. My email is Suharto1@verizon.net. Thanks in advance. As for your question on the lighting system I use for my figure display, it’s just the regular Dioder strips from Ikea. They don’t sell it online, you have to physically go to their stores to get them. Feel free to leave any questions or comments on my blog, I will do my best to answer them. Sorry for late reply and thank you for yours; amazing posts about your Japan trip btw – lots of stuff you bought! Your idea about a reflector seems interesting and having looked at ‘higher-class’ cabinets recently they all seem to have a mirror in place of a glass pannel at the back. This could help relieve the need for lighting inside the cabinet since it would reflect a lot of light back at the figures but it is hard to know for sure unless seen in person. Another advantage would be the ability to see figures from behind as well, although that could be a disadvantage in some cases (figmas maybe?). Also seeing your own face while looking at your figures might be distracting! Still a lot of cabinet space at the bottom will still be wasted – however there is a company near were I live that makes 1/2 display cabinets that are designed to fix to a wall (or could fit on top of a smaller billy shelf so that the bottom half of the structure is for books and the top for figures). Let me know what you think of a mirrored back and whether it is a good idea or not. In anycase I intend to buy one of these to try it out and I will let you know what I think of it once I get one. If it goes well I might have a solution and also buy a a full length version of this. If not, the 1/2 is still ideal but may have to remove the mirror and look at internal lighting. Or perhapes maybe a less efficint reflector than a mirror – like a white sheet used in professional photography? Almost forgot; I added myself to tsuki-board recently having seen many people (including yourself) using it recently. I still have loads to add and need to create pages of figures I have but are not listed but slowly getting there. As you will see I am a big tachikoma, saber and persona fan! Your saber and fate.t dolfies look amazing – I’ll have to look more into those! Hey there Amirsw, thanks for stopping by again. I am glad you like the Japan trip post, I had a lot of fun there during the short couple of days. I have looked at your wall mounted cabinet, it’s difficult to judge from here. As to whether a mirror back cabinet is good or not, it’s hard to say. Interesting about high reflective white background. But do pay attention to glossy surfaces as it may even show a reflection of the lights which could be distracting. Hi! I saw your beautiful DDs on figure.fm. I noticed in this post ( http://www.figure.fm/post/en/1396/Dollfie+Dream+size+Kamen+Rider+Henshin+belt+mystery+unlocked.html ) that you had doll stands. I just recently got my DD, and would like a stand for her. Are these the Volks SD-size stands? Which ones exactly? Which is better, saddle or the waist hold stands? Hi there, Tsu told me you are in my vicinity. I wonder if you have joined the “Chicago Dolls” forums. It would seem that they have meetings around here every so often. Hiya Shinto Cowboy, Tsu had mentioned it! I am not aware of a Chicago Dolls forum, would you mind to point me to the correct site? It would be lovely to go to a doll meet since moving around in group is less embarrassing than a 30-something years old walking around the street with a 1/3 Dollfie Dream! Its not too active forum-wise, but a nice place. I get a bit worry when I see the word “BJD”, cause a lot of resin doll collectors look down on Dollfie Dream in general. Indeed it is a primarily BJD forum, but I haven’t sensed anything from them to warrant me to switch to another forum. Also, they have different dolls, some even has animal ones. Id really appreciate the help ! Replied to your question in email. Love your DD collection so much ! Did you play MSN messenger ? Can I have your e-mail address ? Well, that was an interesting link haha, otakuelimination huh, it would be interesting to see what they think of my blog. Danny is indeed more of a businessmen than anything else right now, he is further and further removed from the community that gathered around him. I am usually very careful with my usage of words, I don’t say anything that I don’t mean it. Not that I care a lot about what he does really, it’s becoming less and less important for me to follow what he does these days; but it wasn’t because of OTACOOL 1, although I never got the book, I don’t believe I should pay for it out of my own money. For me as an individual, I like to mind my own business and seldom care about what other people do. Honestly Moe, I don’t think my room would be chosen nor do I care about it any longer. In any event, I do believe he is getting a bit ahead of himself and lost sight of why people gathered before him to begin with. He might gain some new audiences, and might lose some; but I don’t think he is deceptive in his practice, he has said all along he is running a business, may be some of us just didn’t quite get what he meant by running a business? I’ve been following your blog for quite a while (something like… 1 year and a half) and, since I’m also quite a figure lover, I can’t help but spend some time reading and dreaming a bit with your articles. Since I started being an otaku when I was still a student (well technically I’m still a student), I never really have the capacity to invest large sum of money in this part of my otakuism. But now that I’m working (sandwich course) and paid, I can afford to buy “larger things”. At first, I thought I’d try to adopt a dollfie dream too. But then, some days ago, I went in Mandarake Nakano (yeah, I’m on a trip in Japan right now) and I was quite disappointed. To put it shortly, I found those dollfie dream too small. So here is my question, do you know any larger anime dolls (like, from 1/2 up to 1/1 scale) with the same quality as dollfie dream ones (either ero-dolls or not… even though the first rarely have the quality required…) ? I lurked for quite some time on the net but never managed to find anything “affordable” (something like over 1M yens is quite out of the question…) or even buyable. I tried to install the eroge Madou Souhei Kleinhasa in windows xp mode japanese. I tried to follow your instruction but it keeps saying “this product is not japanese”. So can you please tell how you were able to install that game. My name is Tomohide Kamei. how wonderful Japanese culture is. are not sure about how foreigners are attracted by the OTAKU culture. Would you please help us out by answering the following questions? 1. How do you get information about Otaku-related info? 2. How do you get Otaku-related products such as DVDs, figures, or comic books? 3. What kind of Otaku-related things do you think is hard to get? stuff if it is available? We are looking forward to hearing from you and tell us your favorite anime characters. held on February 6th. The event will have a live on Twitter, and we will upload a lot of photos. In general, I collect most of the otaku related information on the Internet, whether it is directly from the publisher, figure manufacturer, blog sites and finally a one stop Consumer Generated Media site like http://figure.fm for example, have a network of otaku who shares their passion and we can all read about them. Depends on the nature of the merchandise, there are some online shops such as Hobby Search, Hobby Link Japan or AmiAmi already carry them; in some instances where the availability of the merchandise is rare, I might have to resort to using a deputy agent service to acquire any particular item from Yahoo Japan Auction. Event specific otaku goods are generally hard to get for oversea otaku since they are only available at the event, like Wonder Festival or Volks Dolpa Event items for example. 4. Are you interested in the shopping site where you can get Otaku-related stuff if it is available? Yes I am generally interested in shopping sites that can provide a list of event specific items that can acquire and at what price they can be acquired etc etc. 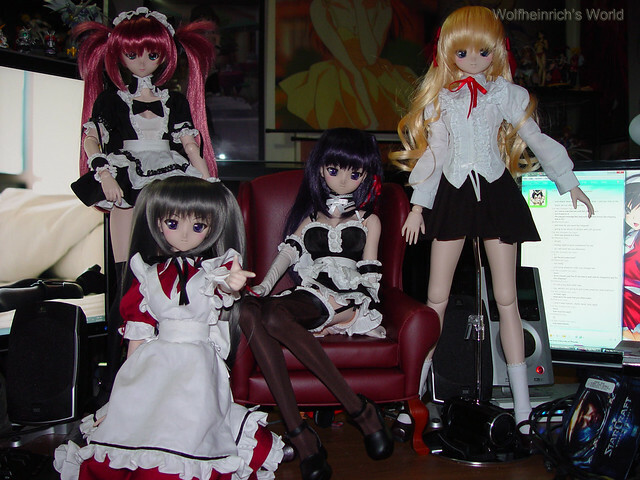 I have many favorite anime bishoujo characters , fortunately many of them have already the form of Dollfie Dream and I can spend lots of time composing photos of my favorite characters in various costumes, like Saber Lily, Kuze Kiriha, Morikawa Yuki and Ogata Rina etc etc. Thank you very much for answering to our questionnaire. It’s very helpful for us. Finally, We opened the Facebook Page of Tokyo Otaku Mode. You can now get a premium OTAKU Photo report of “Wonder Festival 2011 Winter”. Please feel free to join our Facebook Page and get the report. If you like it, please introduce this Facebook Page to your friend and write this on your blog, sns etc. We really appreciate your support and help. Thank you very much and see you on Facebook Page! Thanks for stopping by and leaving a message. As I understand you are interested in acquiring DD Beatrice. In my opinion, it should not be difficult to acquire. While there is no guarantee way to acquire a limited dollfie dream before the event if you are not a current Volks VS/VIP members. But if you are willing to fork out the money, there is always a way. In my personal opinion, it shouldn’t be difficult to acquire DD Beatrice at all. You should be able to use some basic leather treatment to help with that no? if not what did you use to make it not stain? thank you so much !! and i really always look forward for a new post from you! Sorry, your message got hidden behind a bunch of spams and I haven’t been actively working on this site for the past couple of months. If you are still interested, feel free to use anything that’ll benefit your site.